How to survive Christmas and New Year's Eve? Loads of food, alcohol, bad weather – between Christmas and New Year's Eve we are totally full and usually don’t feel very well. If you have juicer, you can make this time more pleasant both for you and your beloved ones! Majority of people drink alcohol at the New Year's Eve. Some of them a little bit more… and the next morning hearts a lot. When you’re drunk, your body needs plenty of water, sugars and vitamin C (500 – 3000 mg). This all is included in our original Hangover remedy! Peel all fruits. 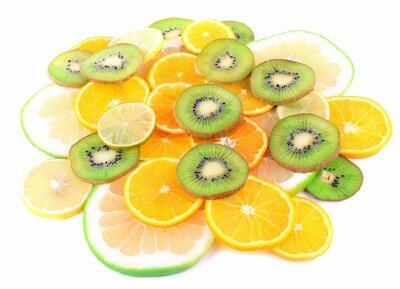 Cut oranges and grapefruit in smaller pieces, kiwi can be juiced as one piece. Put all ingredients in your juicer and sip your tasty remedy as long as you want. In case your head still hearts, don’t hesitate to prepare another one. It doesn’t matter whether it snows during Christmas or not, it’s always handy to have something to warm up. 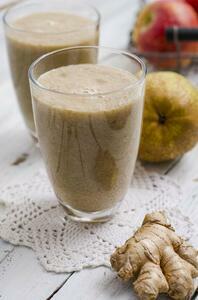 Let’s prepare a fresh juice with ginger and cinnamon, which are the best ingredients against cold. Choose just ripe and hard apples and pears. If you juiced softer ones, you would get puree, which is not suitable for this purpose. Cut fruits in quarters and juice them altogether with a piece of ginger. When you’re ready, stir a little bit of cinnamon in a tasty juice. Almost everybody knows the bad feeling after some days of overeating. In case you want to get rid of it as quick as possible, put carrot and ginger in your juicer and prepare a healthy remedy. 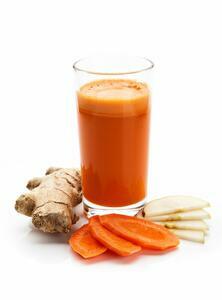 Ginger plays the main role to help you with stomach upsets. Peel carrots and ginger properly and rinse them. Put them in your juicer in turns and that’s it. Enjoy your healthy drink! TIP: You can use yellow honeydew melon instead of carrots.